While flipping through channels on Astro (Pay TV) in Malaysia, I stumbled across Food Network. During my free time in Malaysia, I love watching Asian Food Channel, Food Network and TLC. Coincidentally a short clip came up about Erawan and the prawns looks oh-so-amazing! I was drooling and immediately, I thought of visiting Erawan and giving it a go. Erawan is tucked away in Kota Damansara and is named after the white elephant, a symbol of royalty. If you can see red doors which are hand-carved intricately then you are at the right place. We arrived and the restaurant was packed to the rafters but luckily, we were able to get ourselves a table without any booking and by walking in! Anan runs the restaurant together with his step brother and the man behind Erawan’s kitchen, Chef Trakool Yodsuk or also known as Chef Korn whose grandmother used to cook in the Thai Royal Palace where his culinary influences and inspirations come from. Chef Korn also holds a bachelor’s degree in Marketing and Administration and was an artist. His acrylic paintings and art collections contributes to the interior of Erawan, giving an ornate sense of artistry and welcoming sense of home. The awards received and magazine/newspaper features of Erawan. 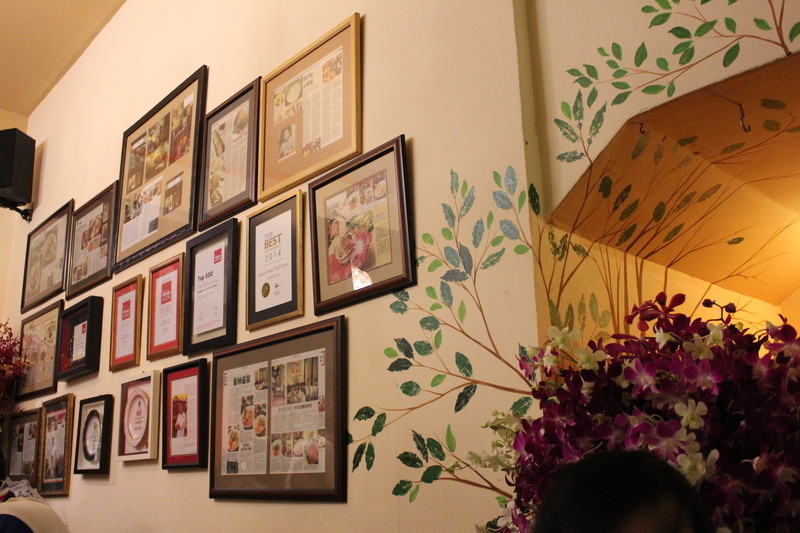 Oh and not forgetting, Chef Korn’s acrylic paintings on the walls! 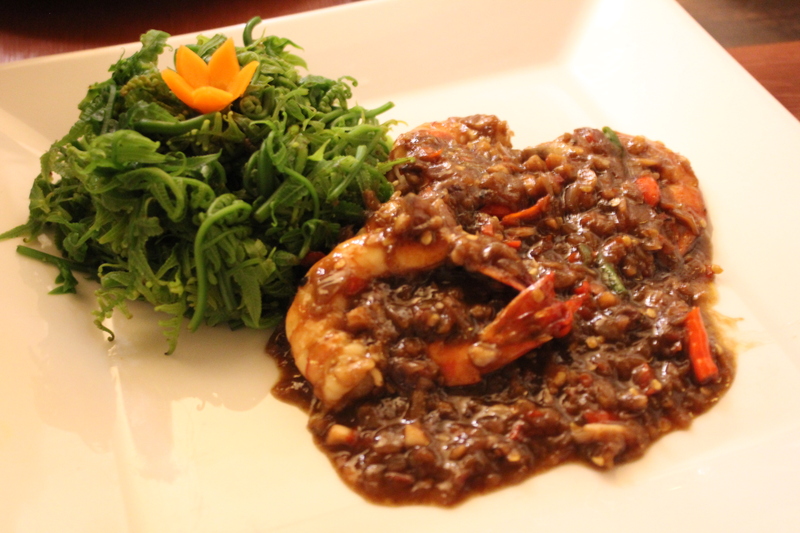 We started off with Miang Kam (RM38). 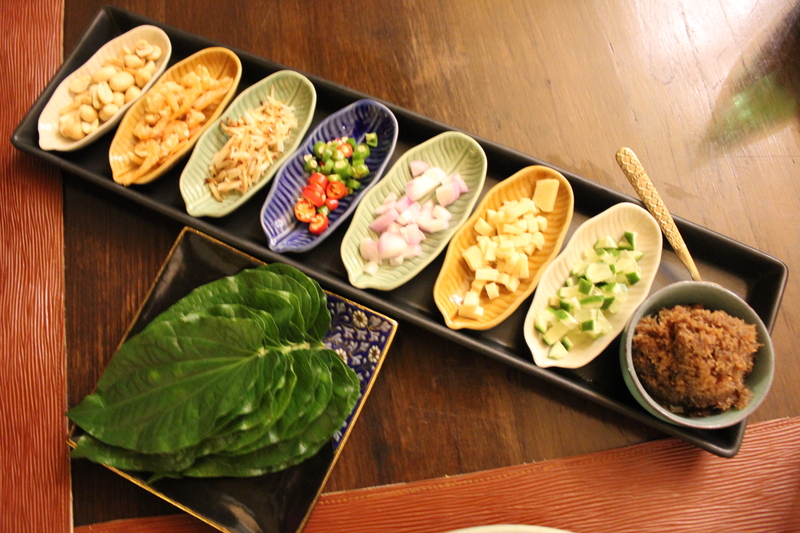 Miang Kam is a dish which consists of betel leaves served with varieties of condiments (purple onion, fresh green or red chilli, ginger, garlic, lime, roasted peanuts and dry shrimps). Each bite was very good and had an aromatic taste with hint of freshness. 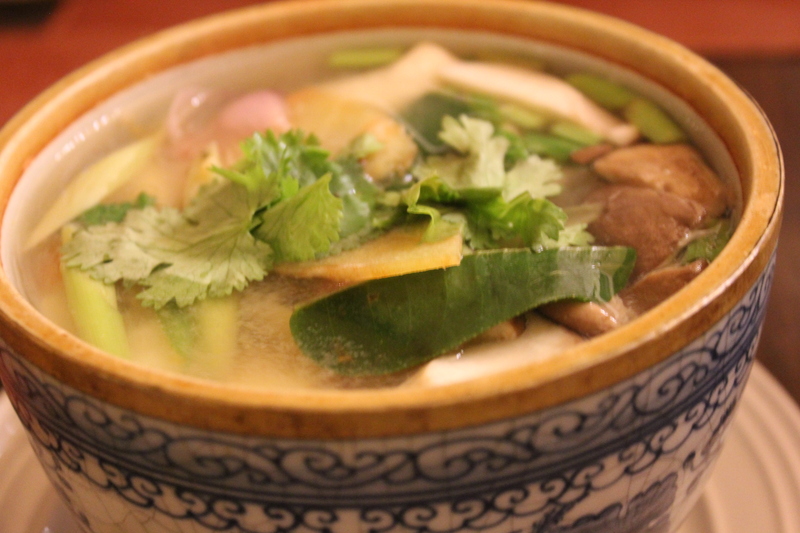 Tom Yum is one of the most popular soups in Thailand and it is one of my favourite soups. Tom Yum is not only delicious but it is good for health because it has immune boosting powers as a natural remedy to combat cold and flu viruses with the combination of herbs and spices. First, you can choose to have tom yum with fresh river prawn (RM68-RM120), Sea bass or Salmon (RM58-RM89), Chicken or Mushroom (RM38-RM58) and Prawn or Seafood (RM38-68). Next, choose between clear or thick soup. Last but not least, the level of spiciness from 1 to 3. Anan recommended Level 0.5 which was the entry level. My verdict? The tom yum soup is one of the best I have ever tasted but…..it was very spicy for entry level spiciness, which is what tom yum should be. With each spoonful of tom yum going into your mouth and down your throat to your belly, you will be singing “This Girl is on Fire”. If you love your chilli and have a good level of tolerance of spice, I dare you to go for 3 – not for the faint hearted. Next up, was the prawn with special sauce (RM120) where the fresh river prawns are deep fried and topped with special sauce. 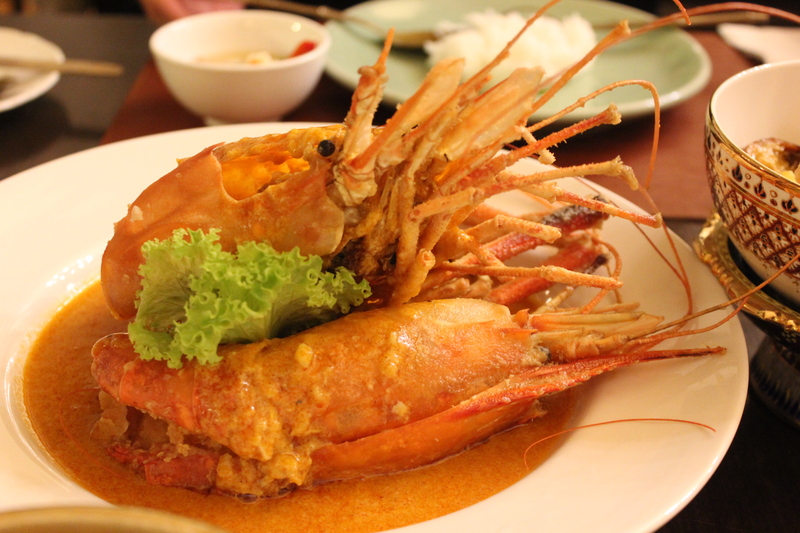 The prawn with special sauce is one of Erawan’s classic and popular dishes – it was even featured on Food Network! The prawns were huge and they were fresh, the meat itself was juicy and tender. And also not forgetting, the special sauce which was full of flavour that you wish you could drink the sauce too! 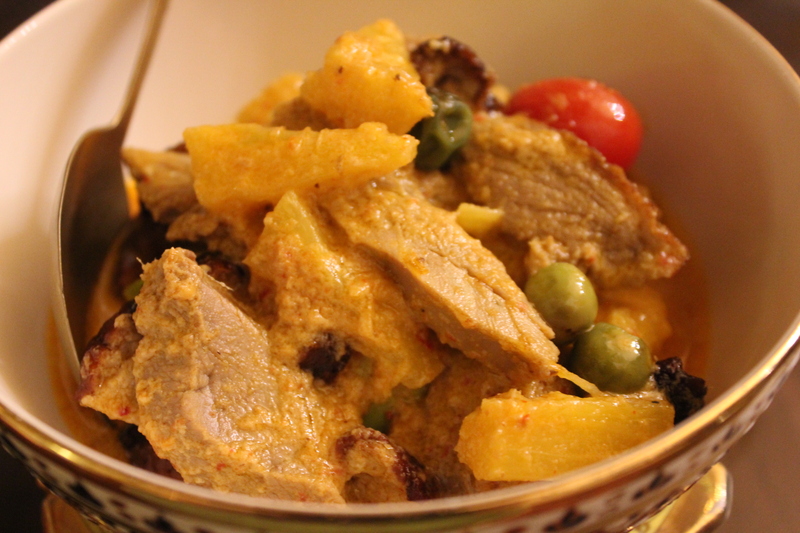 We also shared a boneless roasted duck curry (RM48), which comprises of sliced boneless roasted duck simmered with red curry sauce dressed with pineapple, cherry tomatoes, egg plants and green apple. The duck was tender and cooked to perfection and the red curry sauce was delicious and flavoursome with a hint of sweetness from the pineapple and green apple. Next, was the vegetables with spicy sauce (RM48) which consists of stir fried vegetables (choose from long bean, chayote, petai, paku) with home made spicy shrimp paste sauce and prawns. We had the paku (fern) instead. Anan told us the reason why the vegetables were separated from the spicy sauce was so that the dish could cater to all kinds of levels of spice tolerance; should you choose to dip the vegetables a little bit in the sauce or mix them entirely, it’s all up to you. But I must say that the spicy sauce is really spicy and will definitely give you a chilli kick – a nice complement with the fresh vegetables on the side. A trip to a Thai restaurant is not complete without ordering the iconic Thub Tim Krob or Red Ruby Delight dessert (RM12). To this day, Chef Korn still squeezes coconut milk by hand and maintains the traditional way of using a scented candle for the coconut milk sauce and never buys ready-made coconut milk. 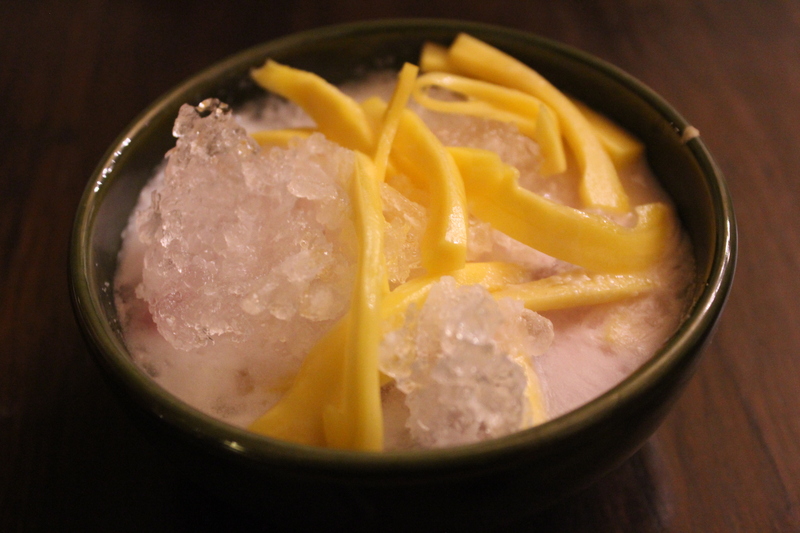 The Red Ruby dessert consists of water chestnut coated with tapioca flour, served with homemade coconut sauce and sliced jackfruit. I think this Erawan’s Red Ruby is one of the best that I have ever had. It was not too sweet, refreshing and perfect on the dot. We also shared a candied cassava (RM12) which is tapioca simmered with syrup until it absorbs and tender, topped with coconut cream. 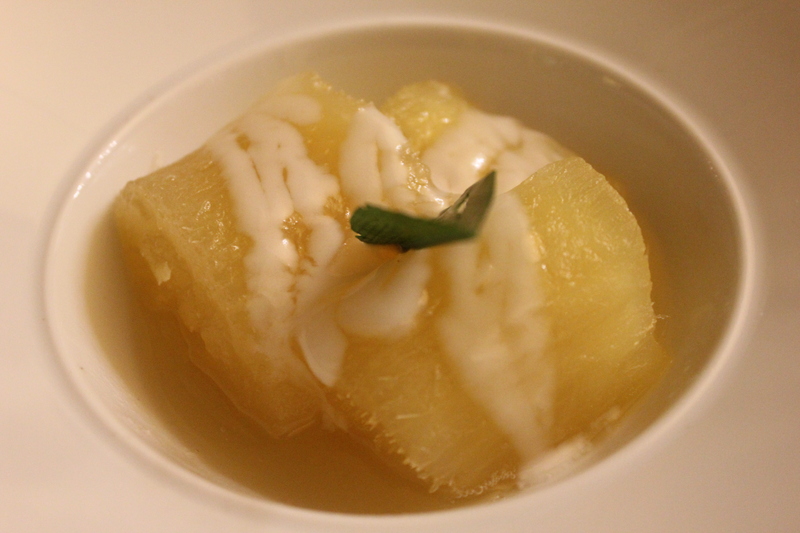 The candied cassava was lovely with a nice hint of sweetness which balances well with the coconut cream. To complement our desserts, we had thai Coffee (RM9.80). 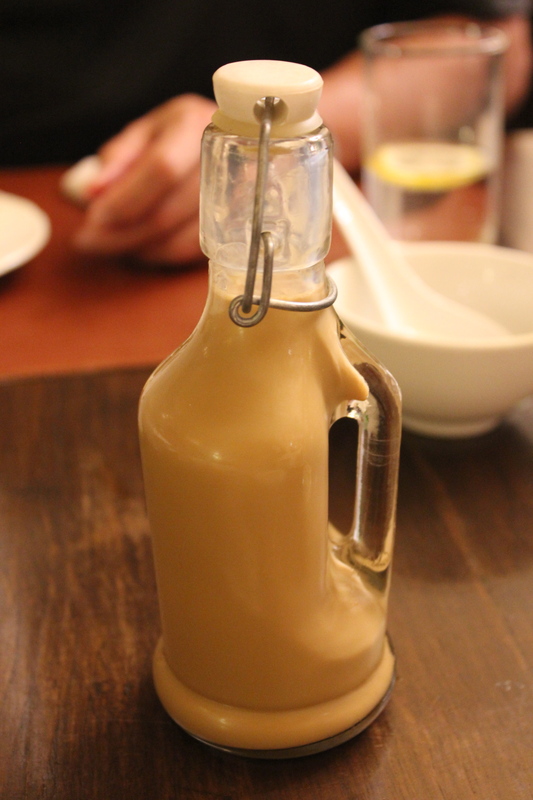 The coffee was fragrant, aromatic and sweet – quite similar to the taste and texture of Vietnamese Coffee. Bookings are highly recommended here and a pre-order of 1 day in advance is encouraged to prevent disappointments as some of the special Thai dishes is needed to be prepared in advance and some popular items on the menu might run out. Check out the menu here and you can always give them a call to pre-book the dishes. I can’t wait to be back in Erawan and it’s one of the best Thai food in KL or maybe that I have ever had. The food is authentic, flavoursome and fit for a king. The service is also very friendly and efficient. I left Erawan with a copy of Chef Korn’s cookbook, Thai @ Home, feeling inspired to cook some of his dishes at home and I am already looking forward to be back to Erawan try the Foie Gras Fried Rice!